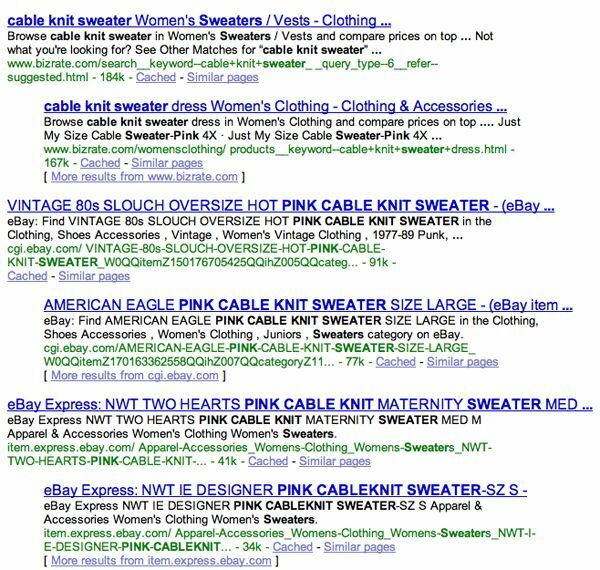 While searchers in the Marketing Sherpa test may have been comparing very similar search results, ecommerce product search results vary greatly, with title tags describing the products in detail. 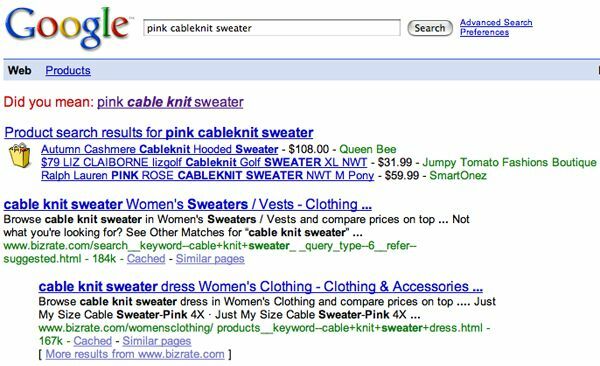 For example, “vintage 80’s slouch oversize sweaters” and “maternity sweaters” both appear in result titles for “pink cableknit sweater.” Online shoppers click through the product descriptions that match what they ultimately want to buy, and the title is far more influential than what the URL contains. Your meta description tags will not help you rank higher, but they can improve your click through rate when you craft them to describe what each page is about. For long tail search, it’s very effective to include brands, product names and model numbers in your descriptions which will stand out in bold text when they match a search query. The more specific the search term, the closer the searcher is to the sale. 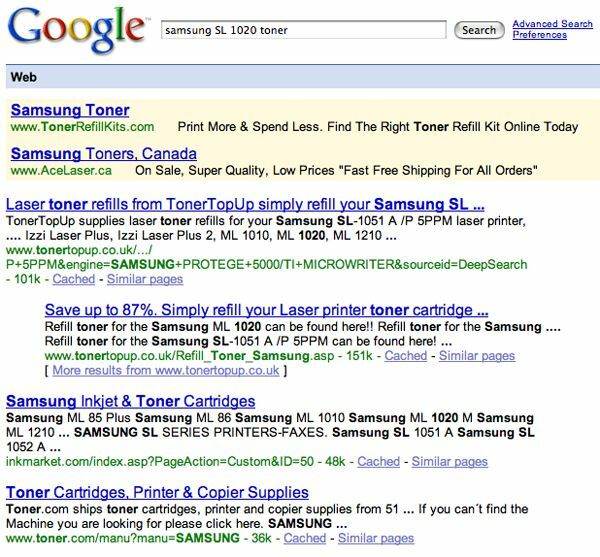 The toner.com result has the simplest description and URL, but the searcher runs the risk that the site won’t have the toner he needs. Search results that show model numbers save a searcher time (unless, of course, the item is sold out or the customer discovers later in the checkout process that the item won’t ship to Canada *hmph! *) It’s important to note that if all your site’s pages use the same meta description tag, it can prevent your site from being fully indexed, as the search engine thinks “why bother, these pages are all pretty much the same.” If you’re not willing to create custom descriptions for each page, it’s actually better to leave the meta descriptions out entirely and let the search engines pull “snippets” from text on your page. Store branding and product brands also influence click through, especially for clothing searches. Ralph Lauren and Wal-Mart may appear back-to-back for “gray turtleneck sweater,” but the luxury shopper is not going to click on Wal-Mart despite a higher ranking or shorter URL. Brands in URLs can have impact as well. Presented with a page full of results for a term like “wireless optical mouse,” a searcher may just scan the left side of the page for URLs for domains of estores that he or she is familiar with and trusts. An indented result stands out and increases your chances of a click by displaying two pages. An indented result appearing as the second result may actually be the tenth listing according to Google’s ranking algorithm, but it gets rolled up underneath a higher ranking page from the same root domain so long as both webpages rank on the same search engine result page. Should the indented webpage slip below the tenth position, the indented result would disappear.. This is just another reason to optimize your product pages for keywords and send them link juice (via keyword rich blog posts, for example) an increase your chances of getting indented. The Sherpa study doesn’t mention Google Products listings and their effect on click behavior. The rebranded version of Froogle, Google Products is a shopping comparison engine that’s free for merchants to submit products to. 1. Google product listings appear above traditional search listings, and may be perceived as recommended (but could also be glossed over by those who are conditioned to search traditional organic listings) 2. With descriptions and URL strings stripped out, the listings are very simple to scan 3. URLs are shown in simplest format – without WWW or .com 4. Inclusion of price generally attracts higher click through 5. Listings often include a brand name I’m interested to how the above factors impact Google Products click through. If you’re planning on starting a new ecommerce blog for your site, Marketing Sherpa’s findings are one more reason to host your own blog rather than using a yourblog.wordpress.com or yourblog.blogspot.com which only beefs up your URL character count. WordPress has a great standard feature called “Post Slug” where you can create custom (and short) urls for each post. So if your blog post title is “The Top Ten Gadgets for Busy Moms on the Go” you can change the url to read “http://yourblog.com/gadgets-for-mom.” An indispensable WordPress plug-in is SEO Title Tag, courtesy of Stephan Spencer and NetConcepts. This plug-in allows you to create a custom title tag rather than the default WordPress tag (your post title), which can help you rank better. For example, using “runners” in your page title and “running shoes” in your title tag gives you relevance for both terms.